SalVinCo.com>12 volt LED Lights>12 volt LED Ceiling Lights - Recess Mount>12 volt LED Lights - Adjustable-Swivel > FriLight 87072 Spot Gyro 12 volt LED Light (10-30vdc) Recessed adjustable eye-light with rocker switch and Multiple LED choices - see Bulb detail. FriLight 87072 Spot Gyro 12 volt LED Light (10-30vdc) Recessed adjustable eye-light with rocker switch and Multiple LED choices - see Bulb detail. Multiple LED choices (see Bulb detail). Plastic 12 volt / 24 volt LED light fixture with swivel eye and switch. 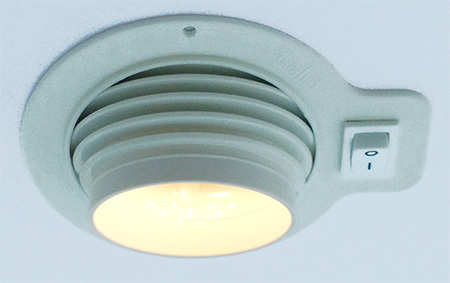 Includes energy efficient G4 LED Bulb (choose from multiple LED choices).